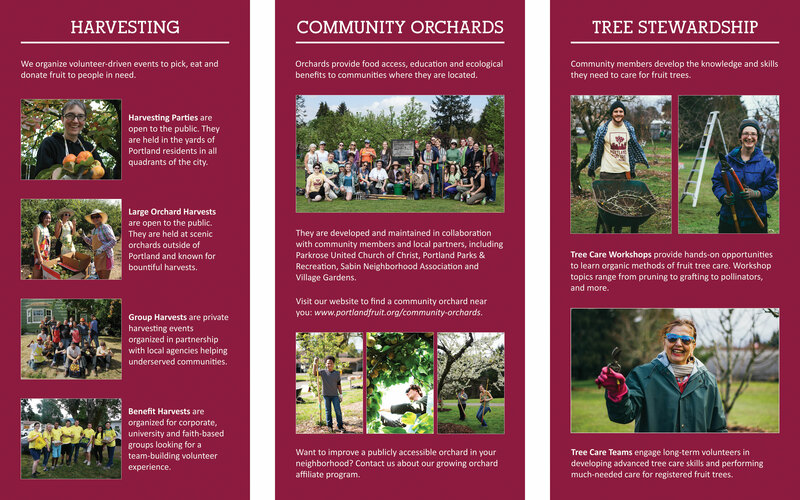 I recently designed a poster series for Portland Fruit Tree Project (PFTP). It hangs on the wall space just outside their two offices. …so the laminated gator board-mounted 3-piece was a mighty improvement. Many staff members made note of the number of people who had positive feedback about this change, and it got me thinking about how we tell stories about our work at work—and in particular, how small companies do it. Since they don’t have waiting areas or receptionists who can spontaneously deliver the low-down to a curious onlooker, expectant interviewee or potential stakeholder, small companies need an office that speaks for itself more than their larger counterparts. The ability to utilize their space to wordlessly express their work is paramount. The obvious challenge in this situation is of course, that small companies don’t have the funds to hire a designer, to purchase awesome decals or to put up lettering that will make gingerbread icing look like child’s play. So what resources are left? As much as small companies tend to want to support other small companies, sometimes it’s just too darn difficult to do it for everything. I’ve had a number of pieces printed through FedEx, including Portland Fruit Tree Project’s poster above, with great satisfaction. They are big enough that you can submit something online, but delightfully flexible, in that they’ll allow you to email a specific store with a file if you can’t figure out how to indicate your print preferences via their online platform. If you don’t have a dedicated graphic designer or communications person on staff, this is very helpful. FedEx also has regular coupons available online—I generally go to RetailMeNot—and religiously includes them when you pick up orders for them. For the nonprofits out there, they also offer a 10% discount to you if you create an account with them in advance. These posters are also great because they are lightweight, durable, moveable, and can be laminated (in case you accidentally throw your morning coffee at it. You can also easily hang these, and allow for re-hanging with Command picture hanging strips. What’s the cost out the door? PFTP paid $200-ish for three 20×30″ posters—which are non-standard size—that were color printed, mounted on gator board, and laminated to boot. An image from Mpix’s website. I found out about Mpix through their owner, Miller’s Professional Imaging, which creates photo products exclusively for pro photographers. Mpix may be aimed towards so-called amateurs, but there’s nothing amateur about their product. These standouts are quality prints mounted on 1.5″ thick pieces of foam board. They arrive with 4 pre-made holes in the back to allow for easy wall mounting, though there is the option to simply stand them up on a desk or other flat surface. They come in a plethora of sizes, so that even if your small company doesn’t have photos taken on a big fancy camera (which tend to shoot in a 2:3 ratio), you’ll be able to print them without having to crop off a vital part of your image. What’s the hit? The smallest standout starts at $30, but if you get on the Mpix list for promo codes that will take the price down when the time comes. Shutterfly markets these books to wedded partners-to-be, but I can assure you, they are just as functional for sharing words and images related to many, many other events and causes. They are highly customizable, available in a variety of sizes from 8×8″ to 11×14″, and the Shutterfly interface allows you to easily upload images from Instagram and Facebook if desired. The pages lay flat for easy reading, and the cover can be made of a range of materials, from leather to crushed silk, depending upon your needs. Pricing for the 8×8″ book starts at $70, but similar to FedEx and Mpix, they have frequent sales and promo codes that you can access by signing up for their list. Copyright © 2019	Nicole Weinstock. All rights reserved.